Daniel 11:32(KJV); …They that know their God shall do mighty exploits. As a believer, you can only function in the things of the spirit to the extent of your knowledge of God. The reason why some Christians jump from church to church and from ministry to ministry, hunting for miracles is because they do not KNOW God. The reason why people perpetually skip from one man or woman of God is because they do not know God. Stop thinking that someone has to be available to seek God for you; you cannot depend on another man’s relationship with God. God must become personal to you. Awake to this understanding child of God. He is not only your Pastor’s God or your prayer partner’s God. He is your God and you ought to know Him like He knows you. Hallelujah! 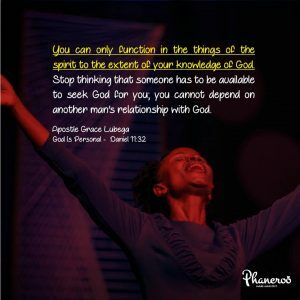 You can only function in the things of the spirit to the extent of your knowledge of God. Stop thinking that someone has to be available to seek God for you; you cannot depend on another man’s relationship with God. PRAYER: My God, I thank You for the opportunity to know You. It is eternal life to launch into the depths of the knowledge of who You are. I choose to yield my spirit to a deeper knowledge of You. My God You are personal to me and You are in every detail of my life. You are my Friend, Counsellor, Comforter, Strength and Guide. Every day You reveal Yourself to me and I grow deeper in this intimacy. To the glory of Your name. Amen. Copyright © 2019 Phaneroo Ministries International. All rights reserved.